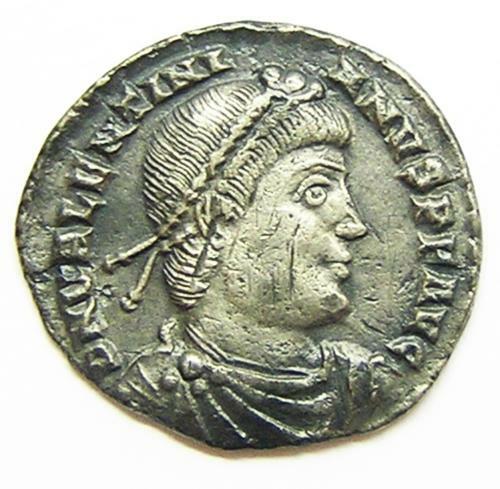 This is a nice ancient Roman silver Siliqua of emperor Valentinian, dating to 364 - 367 A.D. This This coin was minted at Lyon in France, mint mark LVG from a clogged die. RESTITVTOR REIPVBLICAE emperor standing right, holding Victory on globe & labarum. This coin was minted at Lugdunum (Lyons in France) mint mark LVG. It had traveled across the English Channel, being discovered by a metal detectorist in Wiltshire. DATE: 364 - 367 A.D.
ATTRIBUTION: RIC IX Lyons 6a; RSC 18-19+c.